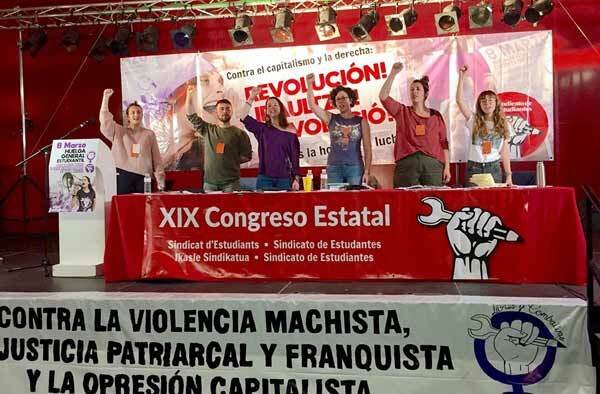 In Australia, over the last year the Socialist Party (CWI Australia) has concentrated its political activity for working women in Victoria on fighting against the Industrial Relations legislation which will impact on the living standards of every Australian woman. Marisa Bernadi, who is an organiser with the National Union of Workers, has been campaigning in her union for a real fight back against the legislation. In April 2005, a ‘Unite’ - Youth March in Melbourne against McJobs, casualisation and attacks on education and training mobilised 500 young people - the majority of whom were young women. Throughout the last year we have been campaigning through the SP Councillor in the Yarra City Council, Steve Jolly, for better childcare on public housing sites in that area. The demands have focused on pressuring Yarra Council to provide more childcare places and for the local council to put pressure on the Victoria State Government as well. There was a successful public meeting on this issue which over 250 people attended. Steve has also organised a resolution that requires the council to employ only workers on Enterprise Bargaining Agreements. This is in direct opposition to the Federal Government’s plans for increasing casualisation. Over the last month, there has been a new public debate over women’s fertility which has shown the need for vigilance to protect the existing rights of women. In February 2006, there was a victory when the Federal parliament passed legislation to allow the Therapeutic Goods Administration (TGA) to decide if the so called abortion pill - RU486 - can be used in Australia. The ‘pro-life’ groups did not want this legislation passed. They would rather support the rights of a foetus than a woman’s right to choose an alternative to an abortion to terminate a pregnancy. They do not care if a woman’s life circumstances enable her to cope with an extra mouth to feed - a child to raise and clothe. These groups are not on the streets protesting against the Liberal Coalition Government’s neo-liberal policies to cut social welfare and privatise all state assets. These same people would rather a child be raised into poverty than provide decent social benefit support for the mother. They do not support providing state-owned housing - the only alternative to making a woman pay for private rental accommodation and move at the whim of investors! Affordable housing and childcare are moving out of reach for ordinary Australians. A recent study by the Australian Institute for Health and Welfare, ‘Australia’s Welfare, 2005’, has shown that 883,000 lower-income families and singles are suffering from housing stress. They spend anywhere from 30% to more than 60% of their weekly incomes on housing. Of the 1.7 million Australians struggling to afford to keep a roof over their heads, more than two thirds are in private rental accommodation. In the last year alone the costs of child care for working women has risen by over 10%. The government’s solution to this issue is to allow private companies such as ‘ABC Learning’ to increase their fees and to pay back to the user from tax-payers’ money 30% of the childcare costs. ‘ABC Learning’ owns over 700 centres in Australia and the USA and controls one-fifth of the ‘market’. In fact by their new ‘benefit to families’, the Liberals are allowing the likes of ABC to increase fees and are using public money to increase their profit margin. The Liberals do not want to provide publicly-owned childcare, believing that anything is suitable for profit, even providing care for children. When women get a job it is often poorly paid and in casual work. Many women and families are barely coping now, they will be suffering even more under the new Industrial Relations laws, which cut peoples basic wages, conditions and rights to join a union. Access to free fertility treatments and free contraceptives. Access to timely, free and safe abortions. Access to free RU486 pills. Access to good quality, not-for-profit childcare centres. For the Trade Union Movement to put up a real fight to overthrow the Industrial Relations legislation. Defend social welfare payments by fighting the cuts, especially those impacting on women, such as cuts to single parents’ payments. Support and defend affordable, good quality public housing with good community resources, including refuges for women wanting to leave abusive and violent relationships.